I didn’t expect to transform other people’s lives during my MBA – just my own – but that’s what happened in Cambridge this year. One of the traditions of the Cambridge MBA is its partnership with Aiducation, an international organisation that awards scholarships to bright and motivated people in Kenya and the Philippines. It launched in 2006 and the Cambridge chapter began in 2009 when a Cambridge Judge MBA student took up the challenge. Each year an individual or individuals are appointed Directors, and for the MBA year 2014-2015, fellow MBA Tony Ngige and myself were awarded this great honour. I took on the opportunity because I saw it as a fantastic opportunity to do something extremely worthwhile and emphatically different. My work experience to date has been in the corporate sector and thus the opportunity to contribute to the not-for-profit world and run a part of the organisation seemed too good to be true. Furthermore, I was pretty sure that the collaborative enthusiasm of the MBA class would mean that my fellow colleagues here would embrace the chance to organise and participate in multiple events, and be able to generate funds to raise important scholarships. Nine months after we started and I can confidently say that we’ve fully embraced the opportunity Aiducation gave us. Our first big fund raising event was sponsoring one of our classmates to shave his beard, which he’d not done for several years. He raised £500 in doing so, and several men followed his lead by either shaving or growing interesting facial hair in solidarity. This event became known as Shaveducation and I hope it will continue in the future! Several events followed throughout the year including baking stalls, a Masterchef competition, cooking classes and a formal dinner in one of the nicest old halls in Cambridge. We also held an auction that featured the prize of having lunch with the former Archbishop of Canterbury. Bu perhaps the highlight for me was the Aiducation talent show. The show featured students and faculty from the business school performing in one of the college theatres to packed crowd and carefully selected panel of judges – one of which was our corporate finance lecturer! 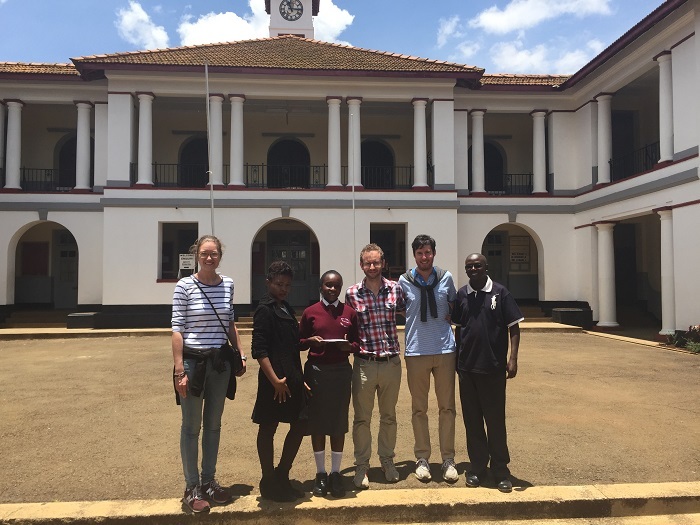 The result of our fundraising is that this year we have raised three scholarships for children in Kenya and the Philippines, transforming their lives and giving them the chance to go to university. In March I got the opportunity to go to Kenya and award the first scholarship to Shalyne, in Eldorado, Kenya. Telling her that she could remain at school and go onto achieve her dreams to be a doctor was one of the most memorable moments of my life and was hugely emotional. The in-person meeting re-enforced why we had, as a class, done so much to raise the money and of the hugely worthwhile and impactful nature of this partnership. As I look back at the year and activities with Aiducation I am extremely proud. These activities form some of my best memories of the Cambridge MBA – having fun, working together (and performing!) with my talented classmates all while making a real contribution to an important cause. I look forward to seeing what next year’s class do! For more information on Aiducation or how to donate please see www.aiducation.org. For some excellent footage of Aiducation activities please search the Cambridge Aiducation Channel.